Despite the fact that human beings argue with other human beings almost every day, we somehow expect our dogs to be friendly with every other dog they meet. Quite clearly, dogs are a social species, but just like us, they can find some other dogs overwhelming, irritating or downright objectionable! However, the fact that dogs tell other dogs to keep away by using threat displays gets them – and their owners – into trouble. Dog-to-dog aggression can be as mild as a growl or a stand-off, and as serious as a fight to the death. In fact, injuries caused as a result of a dog fight are relatively rare, and this is largely due to the ‘rules’ by which dogs abide when using ritual displays towards one another. Even though a minor scuffle looks horrendous to us, dogs are able to moderate their actions in order to avoid giving serious bites – indeed, one of the reasons why such conflicts look so frightening is that the dogs often use a great deal of noise and movement in order to intimate their opponent without having to resort to using their weaponry. In assessing the severity of a dog-to-dog aggression problem, it’s important to establish hard facts rather than just thinking about how much it scared you. In cases where injury has occurred between dogs, then professional advice must always be sought. Where dogs choose not to use self-control, they can inflict serious damage, and fatal injuries – particularly to smaller dogs – are a very real risk. If you can honestly say that your dog has never hurt another dog – no matter how ugly the scenario, then the next questions you need to ask are about frequency. How often does it happen? Is it all dogs that he or she doesn’t like, or just a specific one or two? Some dogs may have only rare altercations with other dogs, while others may be serial offenders. Think about the circumstances. Is it always in the same place that tensions arise, or with the same people? If you are not sure about answering any of these questions, try to vary your own routine and see what happens. Is your dog better when walked in a different area? Is her or she calmer when out with a different member of your family or without your other dog being present? Are you tempting fate by walking past the same gate every morning where other dogs ‘swear’ at yours as you go by? Perhaps the most important part of understanding any behavioural issue is to really see what is going on. For this reason, I often ask owners to video their own dogs in order for us to interpret their body language and emotional reaction to the other dog. I do not need to see a fight though – just the dog out for an ordinary walk tells me everything. Look at ear positions, body movements and tail carriage. Does your dog look worried or anxious at the approach of another dog? Is his flight or fight system already being primed as he sees one in the distance? Are you adding to this by hauling him back on the lead? Is your dog really scared of other dogs, but trying to make himself look bigger and braver in the face of adversity? Be honest. Sometimes we are just so close to our own dogs that we simply cannot see what’s really going on. If this is the case, seek help and seek it early. If your dog is grumpy with other dogs when out on walks, try to follow the five-step advice plan below. If you see no improvement or if matters are getting worse, seek professional help as soon as possible. 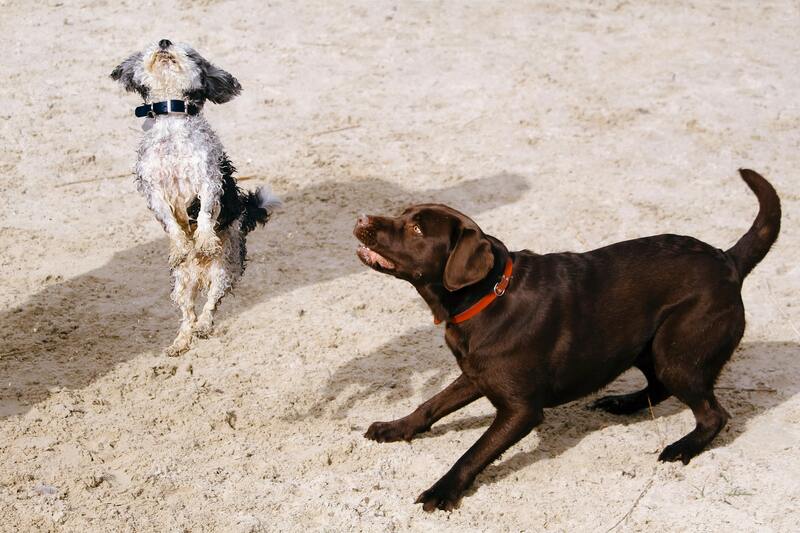 Being in denial is unhelpful to you, your dog and other park life – and you know it. Get over the fact that your dog should somehow know better than to be antagonistic in the park and take responsibility for the fact that his or her behaviour does impact on others, as well as your own enjoyment when walking your dog. If this means keeping your dog on a lead, or muzzled, then do it. If you can predict that your dog will be aggressive to another dog on a particular walk, it’s happening more times than you should be allowing. Change the routine as far as practically possible to alter your dog’s view of what walks mean. Make sure that you take a new route, or go to a new park. Take someone else with you if you normally go alone, or walk alone if you usually walk in a group. Go at a different time, and avoid known aggravations (such as fence-running neighbouring dogs) like the plague. 3. Get A New Wardrobe. No, you don’t have to buy new wellies! This one’s for the dog! If you normally use a short lead and a check (choke) collar, swap to a broad leather collar and an extending lead. Alternatively, if you need more gentle control, try a head-collar or body harness and a long line. If you need confidence, don’t be afraid to use a muzzle. I hear people say that they fear this will make matters worse, but in 25 years in the business this has never been the case. At the very least, other dog owners will give you a wide berth if they see your dog in a muzzle, giving you a chance to work on some uninterrupted re-training. The toughest challenge of all. Change yourself, and your dog will almost certainly change in response. For this to work of course, you need to be self-aware and engage your will-power in difficult moments. When you see another dog, try to relax. Allow your dog’s lead to become loose (most owners tighten the lead and this becomes a trigger for aggression). Behave in an unexpected way. Turn on your heel and walk away without saying a word, taking your dog by surprise in the process. Produce a huge piece of chicken from your pocket and ask your dog to sit. Feed him a chunk every time he looks at you, rather than eyeing the other dog. Watch what happens. At the very least you will be gaining useful information that a professional will be able to gain from, and in turn help you better. 5. Other Dogs = Good Things. Pairing the distant sight of other dogs with good things is a no-harm method of starting to change your dog’s mind about the general presence of other dogs. Each and every time you see a dog at a distance, produce your heavenly dog treats and feed, feed, feed. If your dog won’t eat, it indicates that you are too close to the other dog and you need to move away. Monitor your dog’s reactions. After a number of training sessions like this, look out for signs that he’s starting to look at you when another dog appears, rather than focusing on the other dog itself. This is a good sign and one that you can build on over a period of weeks and months.